In Ghana, in the remote regions to the north the ubiquitous trash along the sides of the road and everywhere else disappears. At first I thought this was because these remote people were more tidy, but I quickly realized that they were so poor that they didn't even have trash. They may not have trash, but they do have cell phone towers. And malaria. And worms. And witch doctors for dentists. 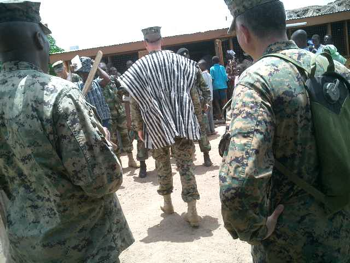 My battalion went to Ghana to train with the Ghanaian army and to provide security for medical, dental, and veterinary assistance to these poor people. Essentially, we gave these people fish, while a few peace corps volunteers there taught them to fish, and their chief controlled those who were allowed to fish. The only other possessions these people had were the clothes on their backs and scrawny chickens and pygmy goats. That's it. They live exactly how people lived 100,000 years ago. Except for the cell phone towers. They were very friendly, and seemed happy. I suppose they were happy to be alive since a huge percent of their children die from malaria or other diseases. 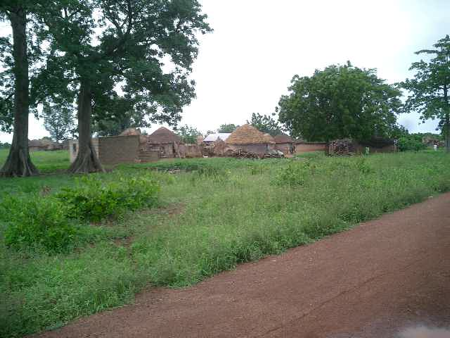 The nearby city of Deboya has a population of about 30,000 I'm told, though I find it hard to believe. These people had a water tower that looked new, and tv antennas from every major home. And very cute children in the most deplorable state of cleanliness. Deboya has a little bit of industry, making clothes in ways not changed for thousands of years. Except not as well. The poverty of this region is due to the tribal system that is empowered by the constitution of Ghana. Tribal chiefs have absolute power over their domain. They say who lives in which hut and farms which piece of land. They are the system of justice and authority. They are sure to get cell phone towers to their region because this is good for keeping them powerful. Providing sanitation is not so high a priority. In fact the Overlord, yes that's his official title, was more interested in us coming to his side of the river, not to help the people there, but because he owns four horses and he wanted our veterinarian to give them a check up. His sickly horses were the only horses I saw in the country. The Overlord was quite impressed with himself. In a meeting with our battalion commander he appointed him a chief for the nearby military camp, but was careful to include that our battalion commander was to be subservient to himself. He gave the lieutenant colonel --now Ghanaian chief -- a traditional smock and walking stick. The rule is that any chief not carrying his stick would be fined. I suggested that the battalion commander should name the Overlord his Officer in Charge of Deboya, but that little return jab would be contrary to our diplomatic role. Back at the new chief's domain of Deboya Camp, the Ghanaian army proved to be very disciplined, well trained, generally well equipped and a lot of fun to work with. Ghanaians are great people. Being a soldier is very prestigious in their country. When one learned that we were reservists and not full time soldiers, he was shocked. Learning that we had regular jobs he asked, then how will others know you're a Marine. We explained that there was never any doubt. The Ghanaian soldiers sold us beer every night and with the traditional African singing combined with British influenced army songs, most nights became like a typical drum circle you'd find at most any Greatful Dead reunion or Austin hippy gathering. About an hour and a half away was a large city of Tamale (pronounced Tom'-ah-lay) and I was shocked to see a huge state of the art Soccer stadium in the midst of their typical squalor. This stadium was much nicer than the one in most American's home towns, it was a world class arena. I asked my counter part, the Ghanaian officer I worked with, how such a building came to be. His answer, that is the reason why we Americans were there. The Chinese government had built six such stadiums throughout the country for free. The Ghanaians were afraid that their politicians would be corrupted by this Chinese largess. The Ghanaians are rightly proud of being one of the few stable and relatively prosperous countries in Africa. They have a military that stays out of politics and a government highly influenced by being part of the British Commonwealth. I think that perhaps the Chinese have the right idea for helping the Ghanaians. Peace Corps assistance is fleeting and tends to make the recipient subservient. Making soccer stadiums allows the country a place to gather and have fun. The organization, markets, and infrastructure to use the stadium will probably have more impact improving lives than a few visits from doctors will and it puts Ghanaians on the same footing as other nations instead of making them feel like beggars. I urge people who are tempted to give money to those typical starving children charities to instead contribute to a soccer stadium. Your 25 cents per day is wasted and won't stop the children from dying of worms or malaria, but a soccer stadium gives them something to aspire to, and focus on, and will do more in the long run than a few bags of rice. I enjoyed my visit to Ghana, but I'd be lying if I told you I would like to visit there again.